One of the least fun places in the world after approximately 30 minutes of maybe-a-little-fun is undoubtedly The Airport. After standing in line for 20 minutes to an hour, having your body extensively x-rayed and then patted down by an underpaid federal employee, there’s little to do beyond buying $5 bags of Sour Patch Kids and listlessly perusing magazine racks. The only way to stay sane — especially when traveling with a child, or a partner who may as well be one — is to throw yourself completely into whatever digital device you have on hand. Most travelers come fully stocked with a full arsenal of gadgets which include but are not limited to their cell phone, laptop, Kindle, iPad, Nintendo DS, and probably several others I have yet to discover. Unfortunately for us, airports don’t just desperately lack entertainment and ungross food options; they also lack outlets. This can be catastrophic to some millennial youth who, having never traveled in a pre-iPhone era, woefully neglect to charge their cell phones where all their pertinent travel information is stored. All of this is to say: There are never enough power outlets at the airport. Which leads me to the matter at hand. A matter so simultaneously pernicious and hilarious, I’m giving myself whiplash. 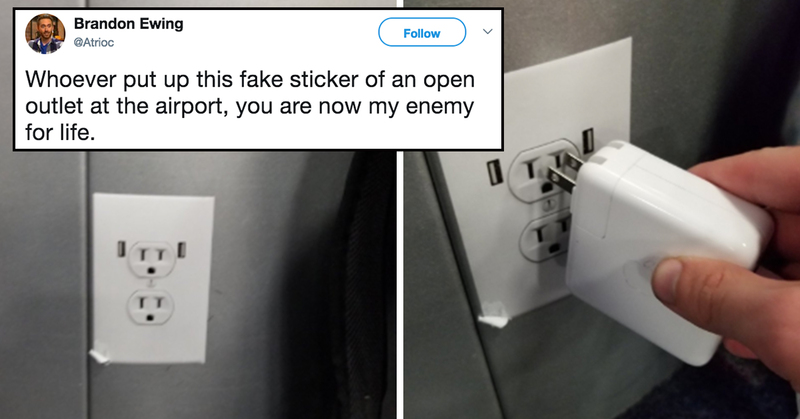 A matter which sees one ghoulish traveller gluing fake power outlet stickers onto airport walls, crushing the hopes of dozens (maybe even hundreds!) in mere seconds. Apparently, he wasn’t the only one dastardly enough to have slapped these puppies up at airports around the nation. The last several months have seen multiple bamboozled Twitter users posting their imposter outlet experiences. The USB ports on others are admittedly a nice touch. If you’ve ever been fooled by an imposter power outlet and are seeking revenge on the entire world, I got you, fam. Turns out a 12-pack on Amazon only runs $8.99, and is an “Amazon’s Choice” product with almost wholly 5-star reviews. If you can’t beat ’em, make other strangers’ lives miserable too.